It’s a fact that everyone has utility and monthly bills: Electric, gas, cell phone, TV, Internet, and the list goes on. And no matter how financially challenged or wealthy someone may be, these essential services are needed and can never be paid off; everyone will have to pay for these services for the rest of their lives out of necessity. So when a global company is open in 25 countries worldwide and endorsed by one of the wealthiest people in the world, who features this company on his primetime reality TV show not once but twice, says you should find out more, would you want to hear more about it? What if this same company said they’d pay you generously for helping others get paid when they pay their monthly essential bills, would you want to know even more? Shane Douglas did, and it’s paid off in an incredible way for him. 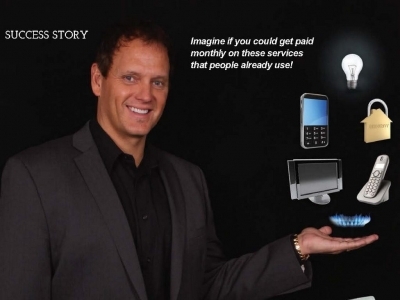 It’s been eight years since this Idaho native in a town of just 1,500 people started his home-based business helping people achieve their financial goals and showing them how they too can get paid every time they pay their own monthly bills. “I was tired of all the promises from other companies that say you can become wealthy over night only to find out you have to sell and teach others how to sell products that are either overpriced or only appeal to a small percentage of the population,” says Shane. Shane explains that recent deregulation of Energy providers around the country has opened up a significant opportunity for more people to choose who they get their services with, people like to know they have a choice, Shane says. This, in turn, creates more opportunity for entrepreneurs to grow their business with our company. “In this declining economy, home-based businesses are on the rise. People want to supplement their income and possibly replace their incomes while working from home. So the opportunity to get paid every single monthly when someone turns on their lights, heats their home, uses their cell phone, watches TV, logs onto the Internet or arms their security system is a no-brainer,” he says. The way Shane has grown to be one of the top income earners and trainers in this business is by following the system the company offers all of its independent business owners (IBOs). He says that he tells people hey can get the same services from the same major service providers, but get paid. Then, according to Shane, all he does is direct them to his online story, which is included in the company’s start-up business packages. Type of Business Comments: Flexible and easy-to-start network marketing and direct sales business. Training Comments: Training including video, online, headquarters and online support. Support Comments: Marketing, leads, technical, online, headquarters and online support. Additional Listing Comments: Shane Douglas is looking to mentor the right motivated individuals this year to achieve success with his premier home-based business model.